This activity was developed by the Lawrence Hall of Science Health Activities Project (HAPS). Students will be able to integrate concepts from social studies, communications, and language arts as they apply the scientific method to this activity. Can be performed as a demonstration or in individual setups and the results can be plotted on a reusable wall chart. Investigate heat loss and the effects of exercise and perspiration on heat loss with this unique lab activity. Students can also explore the temperature variations at different points on their bodies, their temperature recovery times and patterns, and test the insulation effectiveness of dry and wet fabrics. 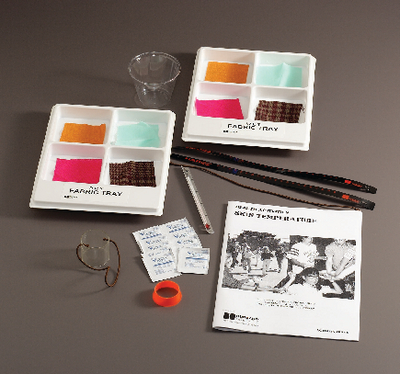 The activity comes with a liquid crystal thermometer strip, bulb thermometer, and a teacher’s guide.